Ajinomoto Philippines Corporation organized a press conference to announce the launch of its newest product, Sarsaya Oyster Sauce and celebrity endorser, Mr. Coco Martin.Sarsaya Oyster Sauce is concentrated from real oyster complete with seasonings to provide a delicius blend of savory, sweet and salty taste to any dish. During the event, a live cooking demonstration and coo-off was facilitated by chef Mcrhyan Rodrigo.He cooked Gisang Kangkong with Tokwa and his own recipe and Thai Style Stir Fried Chicken using Sarsaya Oyster Sauce. 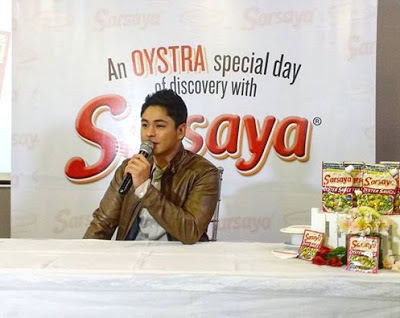 Coco Martin chosen to endorse Sarsaya Oyster Sauce. Aside from being a big fan of his grandmother's cooking, Coco graduated with a degree in Hotel and Restaurant Management. Sarsaya Oyster Sauce is available in 30g pack and 156g stand-up re-sealable pouch. Also try Sarsaya Sweet and Sour Sauce available in 200g stand-up pouch, for a delicious blend of pineapple and tomato flavor.